Today’s SSCI public hearing was remarkably useful, in spite of Chairman Burr’s interrupting a chain of serious questions to ask a clown question of National Counterterrorism Center head Nick Rasmussen. Roy Blunt, Marco Rubio, and Angus King all asked questions about Authorizations to Use Military Force that will be useful in the upcoming debate. The highlight, however, came when Dianne Feinstein asked Rasmussen whether the claims of great harm — provided to her just before she released the Torture Report in December — had proven to be correct. 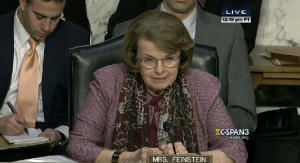 Feinstein: And I have one other question to ask the Director. Um, Mr. Director, days before the public release of our report on CIA detention and interrogation, we received an intelligence assessment predicting violence throughout the world and significant damage to United States relationships. NCTC participated in that assessment. Do you believe that assessment proved correct? Rasmussen: I can speak particularly to the threat portion of that rather than the partnership aspect of that because I would say that’s the part NCTC would have the most direct purchase on, and I can’t say that I can disaggregate the level of terrorism and violence we’ve seen in the period since the report was issued, disaggregate that level from what we might have seen otherwise because, as you know, the turmoil roiling in those parts of the world, not that part of the world, those parts of the world, the Middle East, Africa, South Asia, there’s a number of factors that go on creating the difficult threat environment we face. So the assessment we made at the time as a community was that we would increase or add to the threat picture in those places. I don’t know that looking backwards now, I can say it did by X% or it didn’t by X%. We were also, I think, clear in saying that there’s parts of the impact that we will not know until we have the benefit of time to see how it would play out in different locations around the world. Feinstein: Oh boy do I disagree with you. But that’s what makes this arena I guess. The fact in my mind was that the threat assessment was not correct. Note, Ron Wyden used his one question to get Rasumussen to admit that he had only read the Torture Report summary in enough detail to conduct the threat assessment. Wyden informed Rasmussen there were other parts in the still-classified sections that he should be aware of as NCTC head. Rasmussen and his predecessor Olsen are clowns who wouldn’t know a threat from a thread. Thirteen years ago, al Qaeda was regarded as the top threat to launch more attacks inside the U.S. However, Rasmussen said the danger to U.S. interests at home and abroad has been expanded to include so-called “lone wolves,” the Islamic State and Iran-sponsored terrorists. In fact, he went as far as to say, “We’re far more at risk, presently, of attack from an individual homegrown violent extremist who may be inspired by, but not necessarily directed by,” the Islamic State, otherwise known as ISIS or ISIL. “Iran-sponsored terrorists” had to be said because it is US national policy that Iran is the largest world state sponsor of terrorism, which of course is BS. That’s said because Iran sponsors Hezbollah which beat up on Israel pretty badly when it attacked Lebanon (again). Americans are far more at risk from threat-mongers like Rasmussen. Somebody has remarked that the average American is more at risk from being shot by a toddler than a lone wolf terrorist. Now take those three beautiful American Muslims just shot in their heads and killed in north Carolina. No way was that a lone wolf terrorist, it was merely a dispute over car parking that went bad. A lot was left out of the report. The militarys own investigation revealed loosening up detainees for interrogation by ramming broom sticks where it does not shine was a common interrogation tool. I think those hundreds of pictures Rumsfeld said were so much more sick than the ones we saw would prove some pretty sick acts were used at all camps and sanctioned. A few low levels took the rap for Abu, saying it was just a few bad apples. Release the pictures and let us decide. I can see why many want the talk to stay focused on water boarding. I think there were worse we are not seeing.